On the classic Hindu text from possibly around the third century BCE., which is a part of the Indian Epic poem Mahabharata, attributed to Vyasa, though that probably wasn't a single person. What is it to live wisely? What grounds duty? The text is a conversation on the eve of battle between the archer hero Arjuna and his charioteer, Krishna, who in the course of the text reveals himself to be the supreme God. Arjuna is considering whether it might in fact be immoral to engage in this battle in which he'd end up killing many of his relatives. Krishna assures him that first, killing someone doesn't kill what's really them, i.e., the atman (soul) that survives through multiple rebirths; second, that Arjuna is of the warrior caste, and it's his duty to fight; and third, because of determinism, it's like these people are already dead directly at the hands of Krishna. So, fight on! The Bhagavad Gita was not always considered a central text of Indian philosophy, but became very popular in the early twentieth century: Both Gandhi and Gandhi's assassin cited the text in support of their actions. It focuses less on what you should do exactly but instead, why you should do it. It represents a compromise between two opposing traditions: First, the early Vedas, which just provided advice on how to best provide offerings to the various gods and generate good karma for a better rebirth; and second, the more philosophical take in the Upanishads, which stressed that even good rebirths are still a drag and that you should instead realize the oneness of all (we are all Brahman) and transcend the cycle of rebirth altogether through an ascetic detachment from the fruits of action. The Gita affirms this "yoga of knowledge" ("yoga" just meaning "discipline," literally a yoking of yourself to something) by which one cultivates an identification with this unity, and also promotes the "yoga of action" to avoid the monkish asceticism of the Upanishads: You can and should act according to your duty (determined by your role in society), but if you do so for duty's sake, and not because you'll get some reward, then you'll avoid accruing karma (good or bad!). But still, this kind of super-Stoic/Kantian attitude is hard for people, especially those less philosophically sophisticated, so Krishna also offers the "yoga of devotion," whereby you keep acting, but make each of your actions a devotion to God. So this is sort of like the progression from Catholicism to Protestantism in the West: It's no longer about being tied into certain ritual traditions and authorities, and not necessarily about understanding and internalizing the philosophy, but more about your personal, direct relationship with the Divine. But is there really room in a monistic metaphysics for a personal God? If God is really the whole of existence, why paint a smiley face on it that you should then relate to (as opposed to just be)? We faced this issue before with Spinoza, who likewise held that, strictly speaking, we are all One, but still had a lot of tolerance for (if not actual belief in) views of God as a personality. For Spinoza too, what's essential, whatever your beliefs is a religious comportment, a commitment to duty, to loving your neighbor. Could one, though, be very much aware of his or her oneness with the universe and/or devoting one's every action to duty or God while still performing actions that are morally repellent, that are not "loving" on any reasonable definition? We also discuss the metaphysics, which is very well explained by Keya Maitra in her Philosophy of the Bhagavad Gita (2018), which is the translation that most of us used and includes chapter-by-chapter commentary that connects the text to themes in Western philosophy. The concepts of pakriti (nature) and perusha (self) are sort of like body and mind in the Western tradition, but pakriti, interestingly, also includes character and other mental characteristics, specifically the three gunas, which are genetic and causal personality elements that we all have in various proportions according to this scheme: knowledge (goodness), passion, and dark inertia. So what's left to be perusha, or what is truly mind, under our manifest personality characteristics? Well, it's not something that's part of the causal matrix, but instead just a witness, a point of consciousness that is in fact, were we only to realize it, an aspect of the Supreme Perusha, which is Krishna himself. So there are all sorts of problematic details involved in this account that the text itself doesn't address, but which are discussed at great length in the many commentaries upon it (which we did not read). For instance, the "atman" (self) is supposed to be the soul that is consistent through various rebirths. This seems well positioned to be our personal piece of perusha, but what's the nature of the relationship between that atman and personality and physical body (and gunas) that are associated with it in a given lifetime? It's supposed to be an advantage of the pakriti/perusha distinction over the Cartesian body/mind distinction that we needn't worry about Cartesian interactionism (how does the soul steer the body? ), but in thinking about atman vs. manifest personality, we seem to have a similar problem. Also, if the gunas determine our personality, which determines karmic acquisition, which then determines our next rebirth, which in turn determines our gunas, then is there any sense in which we have free will, i.e., in which case it makes sense to strive for moral excellence as opposed to just letting your character determine your actions. All of this seems to take place on the level of pakriti. Either perusha (your real self) has no causal power, or there are "less pure" levels of perusha that really are entangled in the causal order, in which case we no longer have a hard-and-fast distinction between pakriti and perusha. Maybe this is just as well, since they're both ultimately reducible to Krisha, the one god-substance (called "Brahaman" in the earlier Vedic tradition). But we still have the overall problem of how an all-pervasive god-substance could have "aspects" at all, could have more pure and less pure aspects (higher and lower aspects) without some kind of non-god tainting substance in the mix. (See our Parmenides episode for more on the problems of envisaging a monist metaphysics.) Krishna also describes himself as the seed of excellence in everything; he provides a source of teleological motion (using Aristotle's terminology): for each thing to pursue its virtue is to move toward or in accordance with that part of our character. Conveniently, our gunas are aligned with our caste: bad karma causes us to be born into a bad womb, i.e., a low social station and the gunas appropriate to that. So even though, theoretically, someone of any caste can pursue the yoga of devotion, making this a very egalitarian theology, all those dark-inertia-gunas will as a practical matter make someone of lower caste unlikely to have the fortitude to successfully pursue any of the yogas. So this text has been accused of helping to cement the social hierarchy. Thanks so much to Keya Maitra for sending us copies of her new translation, which you should definitely purchase: Philosophy of the Bhagavad Gita: A Contemporary Introduction . Hear her discussing the project on the New Books in Philosophy podcast. Wes used Stephen Mitchell's 2000 translation, and there are many translations online. For a super-positive explanation of the Gita, check out this TEDx talk by Roopa Pai (note that she dates it at 500 BCE, which is kind of an outlier but within the very broad scholarly range of dates attributed to this). If you enjoy this discussion, try our episode 27 on Buddhist metaphysics. Mark, Wes, and Dylan are joined by Shaan Amin, grad student in political science at the University of Wisconsin, Madison, who grew up with this text. Don't wait for part two! Get the full, unbroken, ad-free Citizen Edition now. Please support PEL! 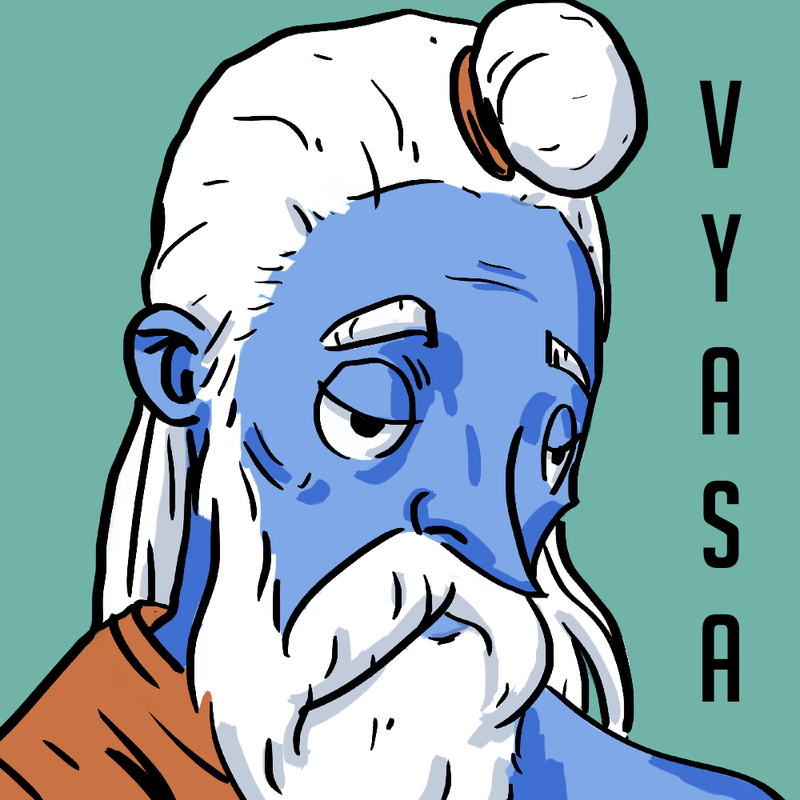 Get the 2019 PEL Wall Calendar featuring this Vyasa portrait and many other philosopher visages by Charles Valsechi. Sponsors: Visit thegreatcoursesplus.com/PEL for a one-month free trial of The Great Courses Plus Video Learning Service. Explore Peter Singer's The Life You Can Save at http://thelifeyoucansave.org/pel. Really enjoyed the episode! Thanks, all. When Mark made the comparative remarks with the Gita and Hegel I was snickering at the Seth in my head calling a name-dropping foul.